Earlier this year, I told you that I was watching emerging market equities and commodities to see if either could fight their way out of their respective bear markets. This week, we saw signs of hope that both are getting healthier, and that just might translate into some very nice opportunities for investors. 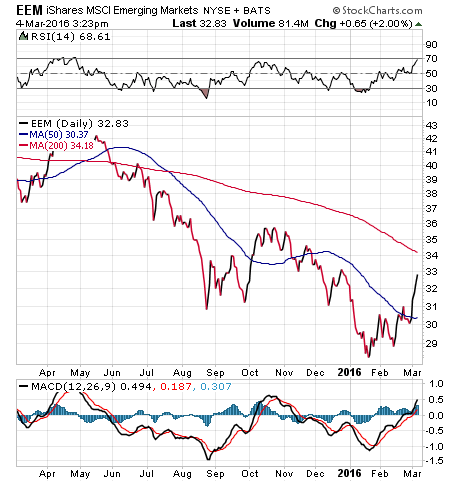 Let’s start with emerging markets and, in particular, the benchmark iShares MSCI Emerging Markets Index (EEM). The one-year price chart above reveals a massive trend lower in the segment throughout most of the year. Yet since mid-January, EEM has been on a tear. This week, the fund broke back above its 50-day moving average, a key metric showing this segment is back from the dead. The other battered segment that’s been reanimated of late is commodities. 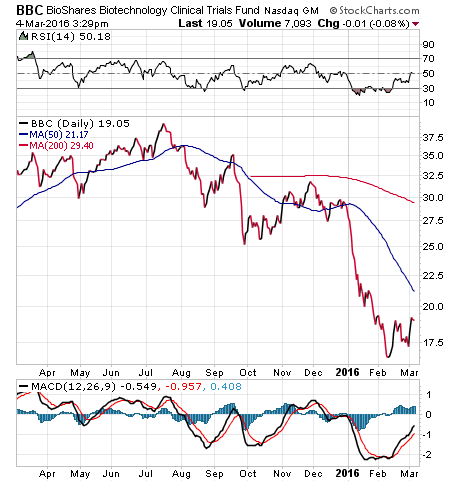 Take a look at the chart below of the benchmark DB Commodities Tracking Index Fund (DBC). Here we see a similar tale as emerging markets, with DBC now pushing past its 50-day moving average. The breaching of both respective short-term moving averages tells us that buyers have now begun to return to these market segments. And while both sectors are by no means out of bear-market territory, the breaching of the 50-day average is a very positive sign for a turnaround — not just for these specific sectors, but for equities at large. 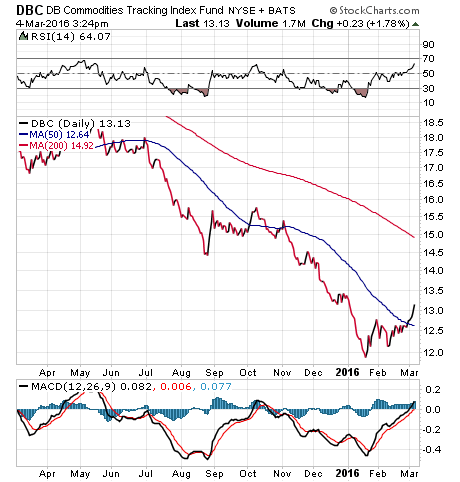 The moves in both EEM and DBC also have had a ripple effect on many of the subsectors in the emerging markets, and in commodities. In fact, subscribers to my Successful ETF Investing newsletter will be adding several new buys that are designed to take advantage of this return from the dead. If you want to make sure you find out what these new buys are, today, then subscribe to Successful ETF Investing right now! Last month, I had the privilege of attending one of the best conferences in my industry, the Inside ETFs Conference held in Hollywood, Florida. This year, the conference featured a most unusual keynote speaker, former U.S. Navy SEAL Rob O’Neill. If you recognize the name, you probably also recognize that O’Neill is credited with perhaps the most famous kill shot in recent U.S. military history — the head shot that terminated Al-Qaeda leader and 9/11 mastermind Osama bin Laden. O’Neill wasn’t allowed to provide details of that operation, but he did share other anecdotes from his days in the ultra-elite SEAL Team Six, a unit that is so secret its existence is officially denied. The former special warfare operator related stories of heroism, teamwork, incredible adversity and uncommon valor on the part of his teammates and fellow warriors. Yet he wasn’t doing this just to impress us with his exploits. The real reason Rob O’Neill was asked to speak at the Inside ETFs Conference is because the lessons you learn in battle also can be applied to your personal relationships, your business — and especially to your investing. Concepts such as the importance of teamwork, the importance of flexibility and creativity, and, of course, the courage and conviction to make strong decisions and to accept responsibility for the outcome (good or bad) all are necessary conditions for successful human interactions. All can apply to one’s own particular business, and all do apply to being a good investor. Interestingly, my takeaway here also applied to the ETF industry. Like any good warrior on a mission, the ETF industry involves teams of hard-working experts joining together to meet a goal. There’s also a lot innovation and creativity involved in bringing new products to market, and in implementing new ideas and strategies that allow investors to achieve their objectives. So, in the spirit of focus, teamwork and creativity of the sort that Navy SEALs employ in battle, and that the ETF industry employs in their battles, we will be taking a look during the next four weeks at many of the interesting new ETFs I learned about at the Inside ETFs conference. From new biotech ETFs to new emerging market funds; and from actively managed income ETFs to international consumer ETFs, the innovation just keeps on coming. Hey, there is even a new series of ETFs created by Shark Tank television show luminary Kevin O’Leary that offer very interesting ways for investors to get market exposure. If you’re like me, you love being inspired by people who show you what’s possible in life, and you also love learning about the new tools available in the market that give you the best chance to achieve market-beating returns. The great American novelist hits on a truism here that I love. Namely, that if you want to achieve anything worthwhile in life, you need to constantly take chances, constantly challenge yourself and constantly be willing to swim out and lose sight of the shore. I encourage you to read my column from last week about the talents and discipline required for successful ETF investing. I also invite you to comment about my column in the space provided below. Which Presidential Candidate Has the Best Tax Plan? Every presidential candidate still in the race has a tax plan for America, but which one is best for our country? Economist Mark Skousen weighs in.